Keswick to Penrith is a "missing link" of just over 18 miles. At it's eastern end the line joins the West Coast Main Line. However, we do not intend to operate it as a self contained branch line or independent Railway. Our plan is to have National Network Train Operators extend their services to Keswick. This will create an east-west network across Northern Britain, complementing the north-south routes which dominate at present. About 55% of visitors to Keswick come from North and North East England - and have no direct rail access ! The purpose of this map is to illustrate how an hourly service between Keswick and Penrith can be built up with just one or two through trains per day to and from each of many useful destinations. Occasional "shuttle" journies, as on the Windermere line, would complete a comprehensive all-day, every-day timetable. 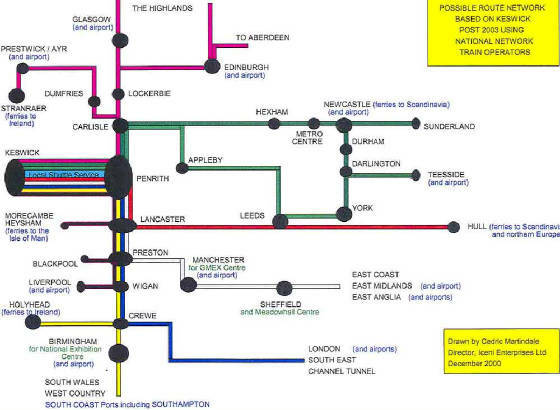 This also shows how many other transport systems can also be usefully connected across the North of Britain, facilitating tourism, business and social travel across a wide area - not just the North Lakes - providing a wide reaching, integrated, system, simply by reinstating our short "missing link". More maps and diagrams are being prepared.